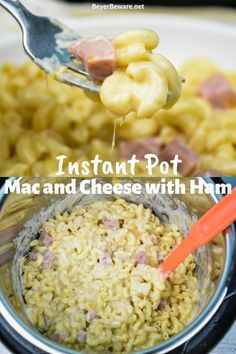 If you haven’t started making pasta in your Instant Pot, start with this Instant Pot mac and cheese with ham. Whether you are using leftover ham or buy ham just for this recipe, this is a quick and easy complete meal your kids will not fight with you about. After all, who doesn’t love a good ooey-gooey mac and cheese? 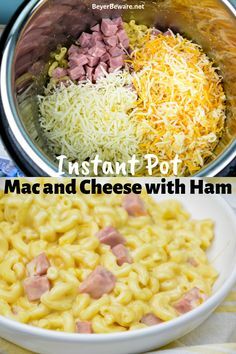 Instant Pot mac and cheese with ham is a quick dinner recipe using three kinds of cheese and leftover ham that is done in under 15-minutes and all cooked in the Instant Pot. This recipe easily can just be a regular Instant Pot mac and cheese recipe with the omission of the ham. Either way, it is my go-to way of making homemade mac and cheese. French Onion anything has a way of getting my attention. I love my French onion burgers. French onion soup is always a weakness for me. Anything that uses caramelized onions has my attention and keeps me coming back for more. Caramelized onions inspired my creamy French onion chicken skillet using boneless, skinless chicken thighs. 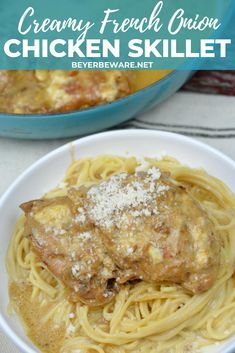 Creamy French onion chicken skillet has a base of caramelized onions used to add extra flavor to boneless, skinless chicken thighs and simmered together with cream to make an easy chicken dinner. © Beyer Beware. You're receiving this email because you've signed up to receive updates from BeyerBeware.net.